Philadelphia is a hotbed for both entrepreneurial creative minds and social injustices, therefore, we have a lot of talent here that are looking to use their talents for good. However, some well intentioned creative work can have negative impacts on a community that starts to feel exploited. Artists and arts administrators need to fully flesh out their ideas and take a critical look at intentions versus impact--meaning the industry needs to check itself every step along the journey of creating activist art. They need to be transparent in the community in which they are working, know how each image, motion or word will affect the truth of the situation and not just give voice to others but let them tell their own story, because they've always had a voice--they've just been ignored. 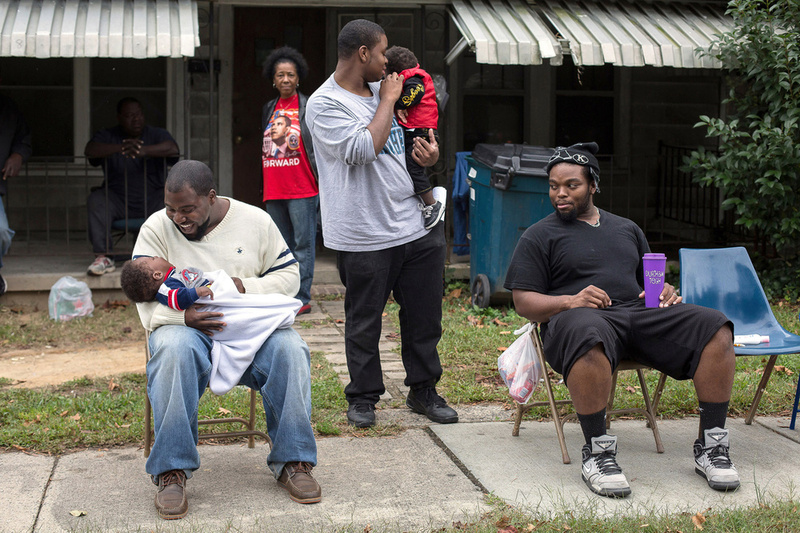 Amy Scheidegger of Artistic Rebuttal Project interviewed photojournalist Justin Cook, who has been exploring homicide, incarceration and urban renewal in Durham, North Carolina for over a decade. 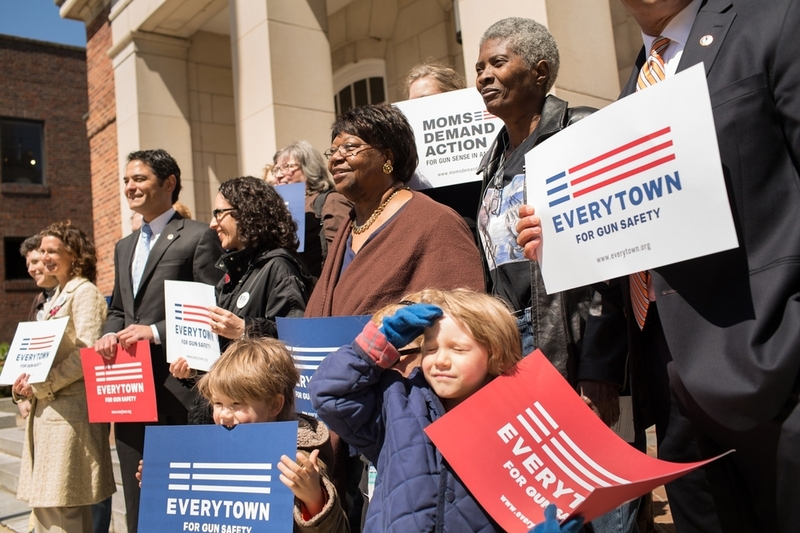 Joslin Simms poses with politicians and gun-control advocates after speaking at a Mayors Against Illegal Guns rally in Chapel Hill in 2014. Increasingly isolated by depression and grief, Joslin found companionship and community in organizations like Moms Demand Action for Gun Sense. She and other mothers who have lost their children to violence don’t want them to have died in vain, so they have organized with the hope of influencing national and local gun, education and anti-poverty policies. Photo by Justin Cook. Artistic Rebuttal Project: Do you consider yourself an artist? Justin Cook: I guess so. Labels are interesting to me and I’ve been thinking about this a lot lately. Some have even called me an activist since my work has a point of view. My background is journalism, but I’m a storyteller that uses multiple mediums to tell those stories. If the journalism world, the documentary world, and activist world all want to claim me, that’s great. I love that my work speaks and appeals to so many. I’m a visual storyteller at heart, so I guess that does make me an artist. ARP: What are some industry and/or self-assigned protocols you employ to stay objective? ARP: Are there instances where you give yourself license to get subjective with the people you photograph? JC: Yeah, of course. Deeper relationships happen naturally and over time. Finding trust, maintaining transparency and building that real relationship are the first priorities, then the work grows from that. I will always cherish my relationship with Joslin, who I’ve been photographing for a decade after her son was murdered. The mutual support we give to each other is better than any Pulitzer. 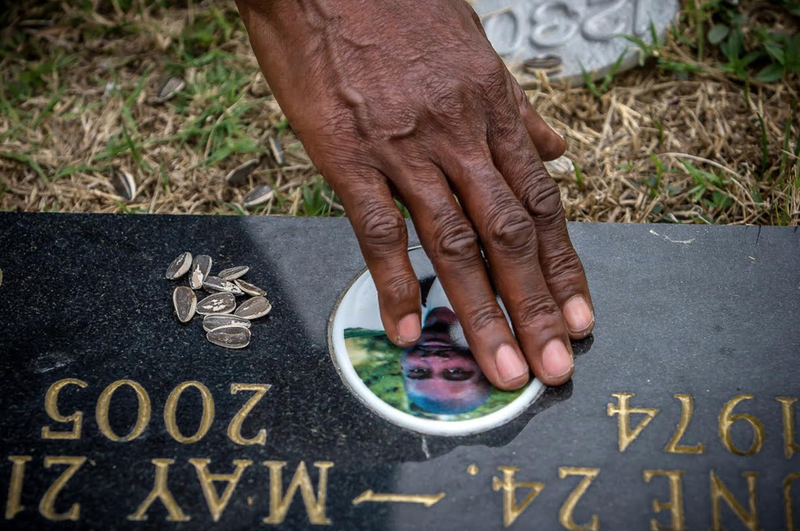 “I just want to go dig up his body so I can touch his face one more time,” says Joslin at her son’s grave in Beechwood Cemetery, in 2007. Her imagination leaves her restless. She sees Ray’s face on the young men walking down her street; “Ray! Ray!” she calls out to them, but when she blinks, their features morph, and suddenly they aren’t him. Photo by Justin Cook. ARP: As an artist, are there any key “do’s and don’ts” of which photographs you’ll present to the public and the ones you don’t, in terms of highlighting your subjects as opposed to exploiting them? Young men revel along Fayetteville Street during Hillside High School’s homecoming parade. Hillside has a predominantly African-American student population and serves many low-income communities in East and South Durham. According to Durham Public Schools data, Hillside once had a graduation rate as low as 52 percent in 2009, but it rose to 89 percent in 2014. Photo by Justin Cook. ARP: What other kinds of professional ethics come up in your line of work in terms of the humans in your photos? JC: Not affecting the story is a big one--not affecting the scene. I aim to photograph the setting and lives of people as if I’m not there, to get the truest image possible. But not getting involved at all is sometimes dangerous, and most of the time, impossible. For instance, in college I photographed a waitress for a story about alcoholism. I needed to photograph her on the hour-long bus ride to her job. On the first visit, I arrived in my car to her home and she asked me for a ride to work. I obviously couldn’t do that since the bus commute was a key part of her story. But once I got enough photos of that, I’d drive her to work the following visits, just to make her days easier. It had no effect on the story. When I feel like I can, I try to give back to those who have opened up and allowed me to be a part of their days. ARP: what are some regular practices you use to make sure you and your work aren’t stolen, misattributed or exploited? JC: I make it a point of educating colleagues, coworkers and collaborators on how to attribute the creator of images. But it happens on such a crazy scale--you have grandmas who use my photos of their grandkids and may not have any knowledge of intellectual property as well as the dean of the school I graduated from using my photos without my permission. ARP: Last question, can you give some advice to emerging arts leaders and artists to ensure their work or the work they represent aren’t exploited? Copyright your work within 3 months of it being published or it becomes public in any way. I hear infringers say “well you should have watermarked your image--it was on the internet.” That is victim blaming. The burden is NOT on the artist to watermark their images for online use; the burden IS on people to not steal work they know they didn’t create. But watermark work if you can and if it doesn't distract from the image. If someone crops out a watermark--THAT is intentional copyright infringement. Push for better copyright law at a national level. Look into companies who will help find copyright infringements. Build alliances in the legal sphere. Maintain UTMOST professionalism AT. ALL. TIMES. You could turn an infringer into a client. 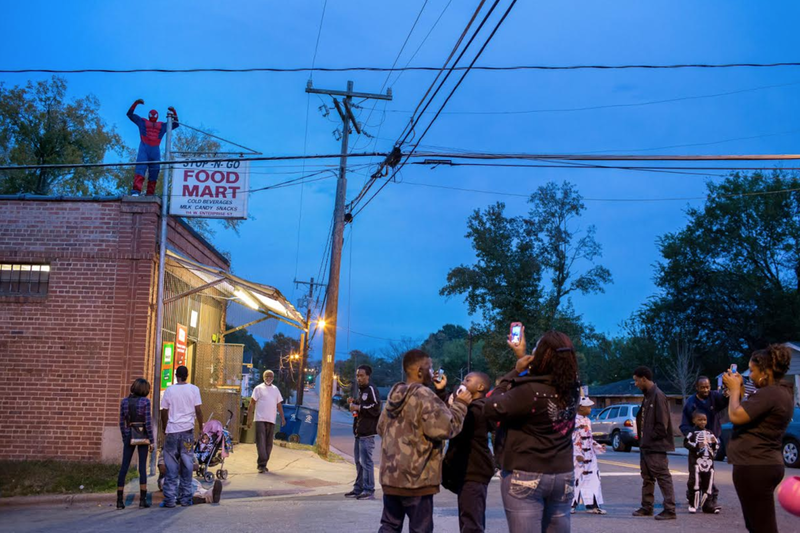 A man who calls himself "Lil' Salt" flexes in triumph after climbing the corner store dressed as Spider-Man during Halloween festivities in Durham's Southside neighborhood. The Southside has endured despite violence in the past decade, but is changing rapidly under the City of Durham's redevelopment plans. Photo by Justin Cook. JC: I’m a white guy who told stories in black neighborhoods. Knowing my own privilege and limitations inside those communities and constantly checking myself was critical. I try to be transparent in everything I do. Often, I show my photos to the people I’m working with along the way which builds trust. Ultimately, I don’t believe in the tired mantra of “giving a voice to the voiceless.” The folks I’ve worked with have a voice, but they are often simply ignored, silenced or have no platform. Building platforms with folks to tell their own stories and collaborating with them is the future. This blog post originally appeared on Artistic Rebuttal Project's Art Urgency blog. Interested in writing or submitting your own blog post? Email us at groundswell@philaculture.org!